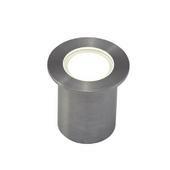 Small recessed LED marker ground light for a variety of internal and external applications. 316L stainless steel bezel and housing, pre-wired with 2 metres of rubber insulated cable. Submersible to a depth of up to 2 metres, 50,000 average lifetime. Supplied less driver.